11 year old account, stopped playing when eoc arrived. 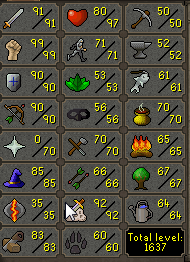 Favourite skill: Slayer, Since slayer is what made all my money from. My name is Cody, I'm a 19 year old Canadian and I work full time as an Ashpalt Paver (dirty work,long hours,good pay). I play osrs in my free time as well as hockey. Love playing games with others as a team(clan), and always looking to learn from others.